The Cold War, in which superpowers sought to maintain a global balance of power without resorting to nuclear arms, masked many local, intrastate conflicts by internationalizing them. What in actuality were civil wars among indigenous groups contending for local power were turned into “virtual” international conflicts fought by proxy. Externally financed economic growth and outside support for authoritarian regimes concealed deeply rooted internal ethnic, religious, social, and economic cleavages. With the end of the Cold War, this virtual bubble burst, leaving an unprecedented number of civil wars. Of the 108 violent conflicts between 1989 and 1998, 92 were considered to be intrastate. Consequently, peacekeeping and peace building have taken on new prominence as tasks for the United Nations. In the first 45 years of its existence, the UN spent 23 percent of its budget, or about US$3.6 billion, on peacekeeping. In the past 10 years this has increased dramatically; 77 percent of the UN budget (roughly US$12.1 billion per year) has been allocated to maintaining peace within rather than across national borders. Unlike interstate conflict, which often mobilizes national unity and strengthens societal cohesiveness, violent conflict within a state can be caused by and/or weakens its social fabric. It divides the population by undermining interpersonal and communal trust, destroying the norms and values that underlie cooperation and collective action for the common good, and increasing the likelihood of communal strife. 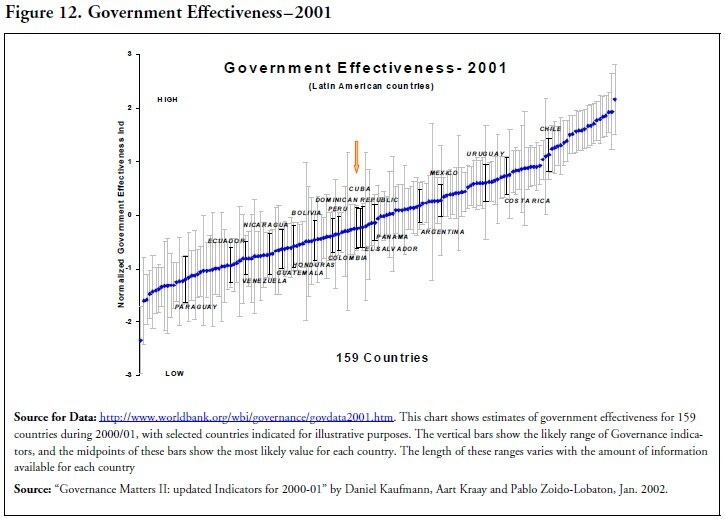 Often overlooked is the governance element triggering or sustaining such conflicts: governments run for private benefit, and societies, clans, or families having to fare for public goods (support of the weak, education, etc. )—the exact obverse of a functional society. This damages in turn the values and social relations that bond communities together, as well as the bridges between civil society and the state which impedes the ability of either communal groups or the state to recover after hostilities cease. Oftentimes, such conflicts are fueled or sustained through corrupt and illegal practices, such as trafficking high-value diamonds, drugs and other forms of using what would otherwise generate “public resources” for private aims (arms, militia, or just siphoning funds to private accounts of local leaders). It would be nice if, by simply curtailing such funds (i.e. acting though the supply side, so to speak), one could dry-up the supply of resources that fuel such efforts. However, for the present, money-laundering arrangements and anti-corruption conventions among countries are in their infancy, their reach of institutions still limited and untested, and enforcement arrangements too cumbersome to make much of a dent on the problem. Accordingly, a more determinate and coherent effort needs to be done to address the demand side of such funds, and with it the underlying drivers of the conflicts, to resolve the problems in more fundamental ways. These relations, predominantly based on kinship, ethnicity, and religion, are largely protectionist, defense mechanisms that form a safety net for basic survival. While surely these conflicts oftentimes are driven by other causes—raw power, ambitions of warlords, simple prejudice and other such factors— the above discussion sheds light on some economic dimensions of conflict and illustrate how issues of governance affect social cohesion. They can magnify or even drive people into violent conflict with several conditioning factors, such as inequality, indignity and exclusion. Each conflict should be properly understood when shaping the structure of peace building interventions (relief, reconstruction, and reconciliation) after hostilities cease. Initially, one must observe the institutional build-up that can take place organically, coping mechanisms to provide to civil society that governments are unable to provide. Because the nature and causes of war are situation-specific and peculiar to each country’s unique condition, efforts for relief, reconstruction, and reconciliation need to take note of these differences. Both bonding and bridging efforts within civil society require a move toward welfare and social protection and, to an increasing extent, growth and development. As conflicts begin to wane, traditional types of social organizations, such as pagoda and funeral associations in Cambodia, associations of widows and orphans in Rwanda, Mayan women’s associations in Guatemala, or even private local entrepreneurs in Somalia have sprung up to provide public services, caring for vulnerable groups or act as catalysts for the peace processes. By the same token, new forms of civil society can be shaped to underpin more advanced forms of public sector institutional development. In Guatemala, for example, networks of civil society organizations such as a confederation that constituted the Chapter in Formation of Transparency International (TI) helped monitor actions of public institutions, such as Congress and other aspects of nation building. • Building, empowering and enabling an active civil society that protects the rights of the individual and of groups while engaging and holds emerging state institutions accountable to the rule of law, including actions that: (a) ensure freedom of information; (b) provide for publicly driven hearing or similar arrangements for drafting laws, regulations or other vehicles of governmental acts; (c) develop media, civil society organizations, etc. ; and (d) build checks and balances to ensure independent and effective judiciary, decentralization with accountability, and support the above-mentioned civil society oversight arrangements. • Establishing accountability of political process and finance through: (a) disclosure of parliamentary or equivalent legislature votes; (b) transparency in party financing; (c) asset declaration, conflict of interest rules and/or similar actions to build transparency of associated sections of political processes. • Supporting local efforts through global institutions, by building up the transparency of their transactions, including their tax and royalty payments, imports and exports, and their business standards and associated internal control arrangements. Corruption is a complex phenomenon and in many cases is the consequence of more deep-seated problems of policy distortion, institutional incentives, and governance. Therefore, it cannot be addressed by simple legal acts proscribing corruption. In fact, in virtually all countries, local laws forbid corrupt behavior. Yet, in more cases than is readily admitted, effective efforts to combat corruption have been limited. 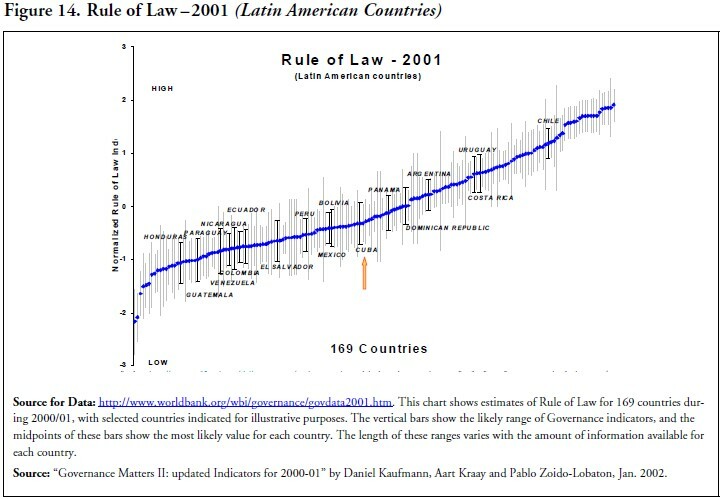 The reason is that, by definition, in many developing and transition economies, the judiciary, legal enforcement institutions, police, and other legal bodies are unreliable because the rule of law is often fragile and therefore can be captured by corrupt interests. This is particularly the case in zones of conflict. 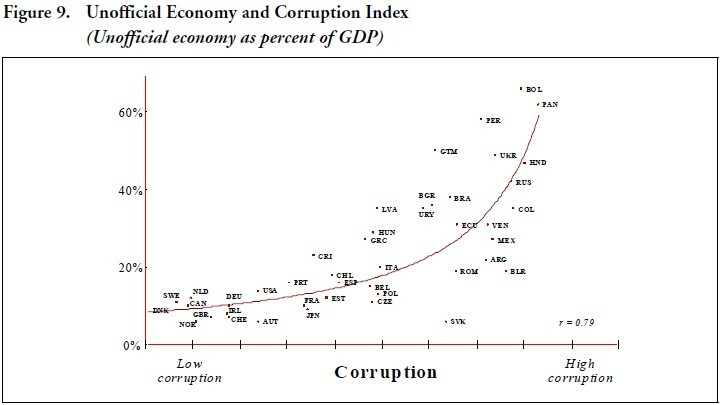 But corruption is not limited to these economies. In developed countries, tax incentives, standards of conduct, and general attitudes often lend themselves to providing the resources for corruption. Indeed, “the abuse of public office for private gain,” as corruption is generally defined, takes place in rich and poor countries and must be tackled as much in the places where payments originate as where they are received. However, where public governance arrangements are weak or non-existent, such as in war areas, conditions are prone for corruption. By the same token, not only the size, but also the composition and associated quality of public investment programs are affected by levels of corruption. By and large, corrupt administrations tend to spend less on education and other social expenditures because expensive infrastructure or the maintenance of large defense (including arms) expenditures outlays crowd out spending on education and other investments in people.3 This suggests that corruption tends to mortgage future generations, since economic growth over the long haul is directly related with educational attainment. The secondary effects of policy distortions can be equally staggering, since they produce multiplying effects throughout the economy, as discussed later on in this paper.4 This is particularly serious when generation of savings and surpluses are already far short of the investment requirements in that continent. In all, these are the vehicles through which corruption lowers economic growth. An implication is that economists should be more restrained in their praise of high public sector investment and stresses the importance of placing much greater attention on corruption as well as on the quality and composition of public expenditures. The issue of corruption, and its attendant effects of efficient and effective resource use, needs accordingly a much higher place in the policy debate among all concerned. 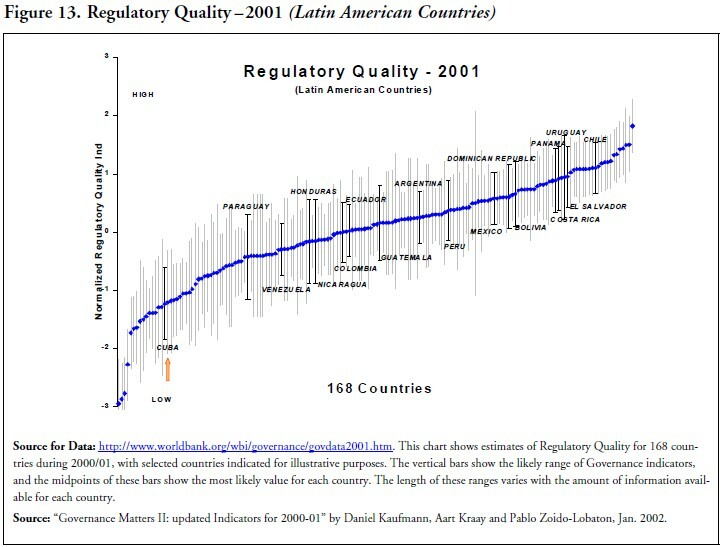 By the late 1980s and early 1990s, most countries in Latin America adopted structural adjustment, economic liberalization, and “modernization” policies, aimed at coping with and preventing economic crises by developing building blocks to improve the agility and effectiveness of public sector management. A mixed reform record has brought about recognition that the problems were more fundamental than they were thought of originally and that a “second generation” of reform is needed. Similar actions have started in much of Africa and Asia. In light of a growing recognition of the complexities of the reform processes, an increasing number of countries is beginning to tackle broader and deeper institutional issues, such as decentralization/sub-national government reform, judicial reform, and anticorruption efforts. Some countries are going beyond these issues and are tackling issues such as “voice”/ participation; “exit”/competition; restructuring of enforcement mechanisms of internal rules and regulations. Work in these new areas requires stronger, broader and deeper commitments for sustainable implementation and, with it, increasing demands on TI Chapters (such as is occurring in Argentina, Chile, Paraguay or some countries with serious civil records such as Colombia or Guatemala). Clearly, a more comprehensive approach is needed than the popular road of issuing declarations, policy statements or even legislation. More importantly, to assure better results, a greater focus is needed on the underlying causes of corruption and on mutually supporting mechanisms between governments, business practices in the private sector, and civil society. But corruption is not limited to these economies. In developed countries, tax incentives, standards of conduct, and general attitudes often lend themselves to providing the resources for corruption. Indeed, “the abuse of public office for private gain,” as corruption is generally defined, takes place in rich and poor countries and must be tackled as much in the places where payments originate as where they are received. To assist governments, the business community and other interested parties debate on the issue, Transparency International (TI) has been publishing an increasingly comprehensive Corruption Perceptions Index (CPI). This index is a “poll of polls” drawing upon numerous distinct surveys of expert and general public views of the extent of corruption in countries around the world. 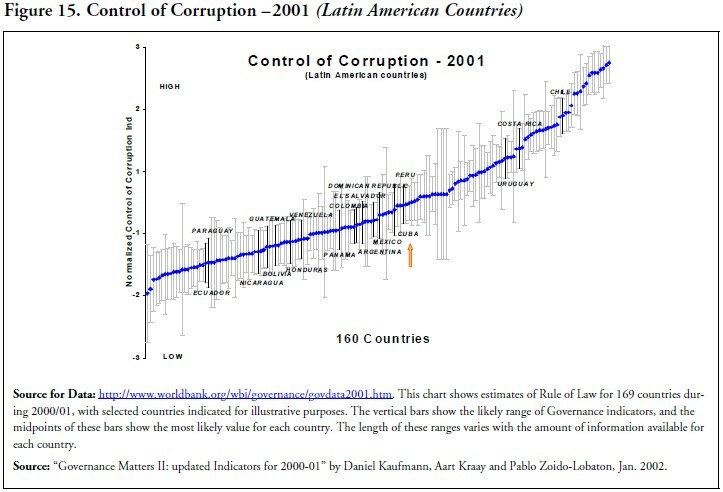 Recent data show that the bulk of countries, including those in the Latin America region, have poor scores—ratings of less than 50%— thereby strongly suggesting that corruption is a serious issue, deserving much higher attention in the policy agenda of this region. In this regard, it should be understood that bribery encompasses payoffs for a variety of illicit activities: (i) getting around licenses, permits and signatures; (ii) acquiring monopolistic power—entry barriers to competitors; (iii) access to public goods, including legal or uneconomic awards of public procurement contracts; (iv) access to the use of public physical assets or their outright stripping and appropriation; (v) access to preferential financial assets—credit; (vi) illegal trade in goods banned for security and health considerations, such as drugs and nuclear materials; (vii) illicit financial transactions, such as money laundering and insider trading; (viii) influencing administrative or legislative actions; and (ix) influencing judicial decisions. In all these cases, corruption occurs when economic opportunities for it prevail and political will to combat it is lacking. In a way, corruption is a symptom of fundamental economic and political problems. Addressing them effectively therefore requires dealing with the underlying economic, political, and institutional causes. At the root of many of the problems, often times one can find excessive discretionary powers. For this reason, reducing opportunities for discretion is often an important element for prevention. These typically include liberalization policies such as reductions of trade restrictions, subsidies, price controls, and directed credit, that have been undertaken in a growing number of countries in Latin America, as well as more recently in Africa and Asia. 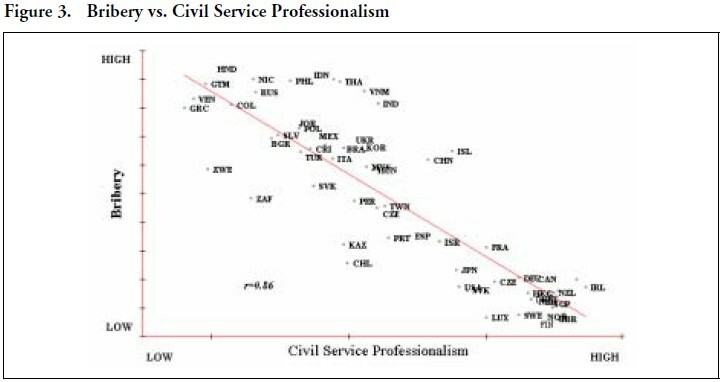 Conversely, it stands to reason that the higher the professional levels in civil service on the sheer existence of a credible public administration (a particular neuralgic issue in zones of conflict), the lower are the perceived levels of corruption. Quite apart of the wastefulness of corruption expenditures and associated misallocation of resources, valuable management time gets siphoned off through time spent with public officials. Accordingly, on the enforcement side, weak institutions often require the help of independent oversight commissions with powers to investigate and, at times, prosecute or adjudicate, as has been instituted in Chile, Hong Kong, Singapore, and Botswana. This can be a particular promising avenue to dialog, or avoid as much as practical judicial systems, which tend to be cumbersome and slow in producing corrective action, given their underlying adversarial process arrangements. 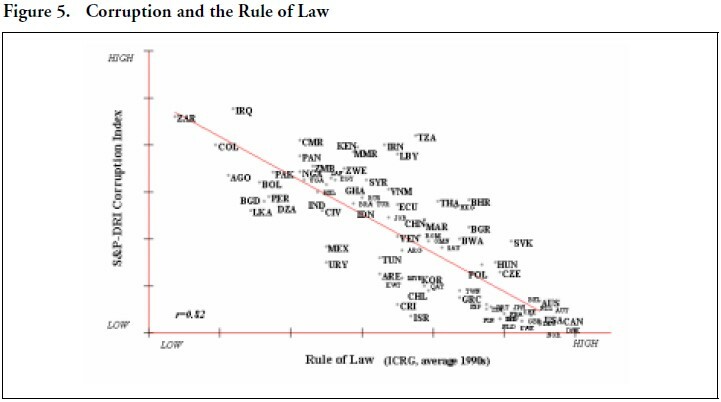 More generally, and not surprisingly, corruption perceptions tend to be higher, the weaker the rule of law in the countries concerned. Almost by definition, this factor makes zones of conflict easy prey for corruption. Finally, proper interface needs to be formed between civil society, the private sector, and governments to help assess the issues and develop support for combating corruption and to develop more effective ways of doing business. More than in any other field, corruption is not an area that lends itself to technocratic solutions developed by a few and executed by many; long-term and sustainable development requires a real stake of all concerned and often needs homegrown and tailor-made solutions. Most civil societies are new and weak. The former have decision-making procedures and clear lines of communications; civil society has none of these. Governments and private companies have authorities to please and schedules to be followed; civil societies have nothing of the sort—and yet must respond organically to people’s concerns. For the most part, there is a mismatch between civil society’s capacity to perform its role and those of Government and private sector. That being said, a number of regions have already started to undertake positive strides ahead in a number of key areas. In the United States, the United Kingdom, and many of the western democracies there is a long record of and experience built on transparency in decision-making and involvement of civil society. 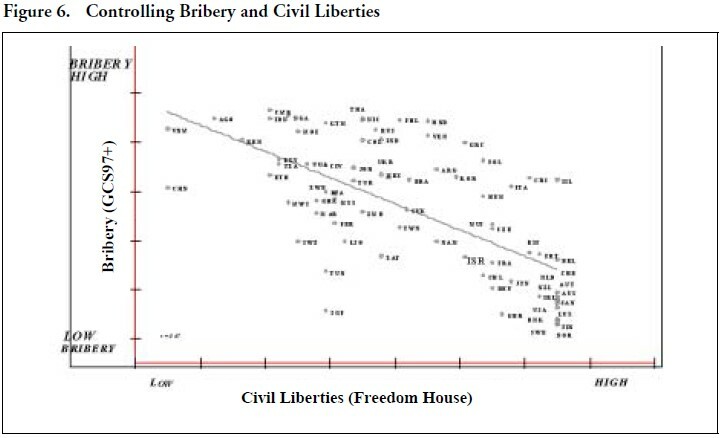 More generally, though, the more pluralistic the societies, the lower the levels of corruption. Also in a growing number of countries such as in Latin America, aside from the structural reforms under way, there is a growing civil society, including some twenty TI Chapters in various stages of formation, which are engaged in a growing number of strategic activities. The Bribe Payers Index (BPI) ranks the leading exporting countries in terms of the degree to which their companies are perceived to be paying bribes abroad. The BPI indicates that corruption is widely seen as playing a significant role in international commerce. The data provides a disturbing picture of the degree to which leading exporting countries are perceived to be using corrupt practices. Business executives and professionals in leading emerging market countries see international bribe paying to be greatest in the public works and construction sectors, followed by the arms industry. Particularly disturbing is the high corruption associated with resource-based industries—the economic bedrock for many developing countries.5 Take the case, for instance of petroleum, where countries like Nigeria, Indonesia, Algeria, Mexico export anywhere between US $2 to 35 billion, depending on oil output volumes and prices—and yet their performance in terms of GDP growth is significantly lower than countries in the same income per capita levels. Where has that money gone that there is so little to show for? It thus is not surprising that petroleum producing countries tend to fall in the lower percentile categories of governance ratings, where corruption figures high. But the secondary effects, downstream, are equally devastating though much more widespread. Petroleum products play a pivotal role in Sub-Saharan Africa’s economic development. Their purchase absorbs 20-35 percent of export ratings for the bulk of the countries in the region, and generates approximately 40 percent of tax revenues—thus constituting the single largest item in the balance of payments and fiscal revenues for most countries in this region. Although the primary energy balance is currently dominated by household consumption of fuel wood, petroleum products are the most important source of commercial energy, supplying approximately 70 percent of commercial requirements; and they are likely to be the fastest growing portion of the region’s energy balance as the continent’s modernization unfolds. As the region becomes more developed, the demand for energy will also grow, thus setting up a vicious circle: Economic growth will be needed to pay for the expanding oil bill, and more imported fuel will be needed to generate economic growth. These countries must make fundamental policy choices with respect to the petroleum industry if they are to escape this self-defeating cycle. Except for Angola, Cameroon, Congo, Gabon, and Nigeria, all countries of sub-Saharan Africa are net importers of crude oil or petroleum products. Data comparing per capita GDP to oil imports show that the lower the per capita GDP, the higher the percentage of net imports represented by petroleum. Greater efficiency in procuring and distributing petroleum products would reduce the amount of funds these countries devote to paying their oil bills, thus freeing those resources for the other uses and potentially reducing the poverty level do these countries. And yet massive resources “disappear” from the way the business is conducted. If corrected, savings of about US$ 1.4 billion a year at 1989-90 prices. This amount is greater than total World Bank annual disbursements of adjustment policy loans, and close to 50 per cent higher that the net disbursement to the entire region combined. These savings represent the difference between the actual cost of supplying petroleum products to consumers and benchmark cost corresponding to procuring these products from world markets under competitive conditions. As one reviews transaction throughout the supply chain, fully half of resources cost could be recuperated at the point of procurement, some 40 % at the refining stage, and the remainder through inland distribution. Moreover, the greater losses are associated with discretionary power and monopoly arrangements. The inescapable conclusion is that hydrocarbons procurement and distribution must be opened to the discipline of greater competition. Indeed, the experience recorded in other regions (Western Europe, southeast Asia, and Latin America) that have allowed numerous available suppliers to compete in their markets suggests that a policy change in Africa along these lines would provide significant benefits to the continent, in the form of more efficient and corruption free petroleum procurement and trade. Going beyond the production and distribution of natural resources industries by multinational companies, corruption is of growing concern to donors, nongovernmental organizations, governments, businesses more generally, and citizens, in developing and industrial countries alike. Fortunately, the opportunities to address corruption are also greater than they have ever been. 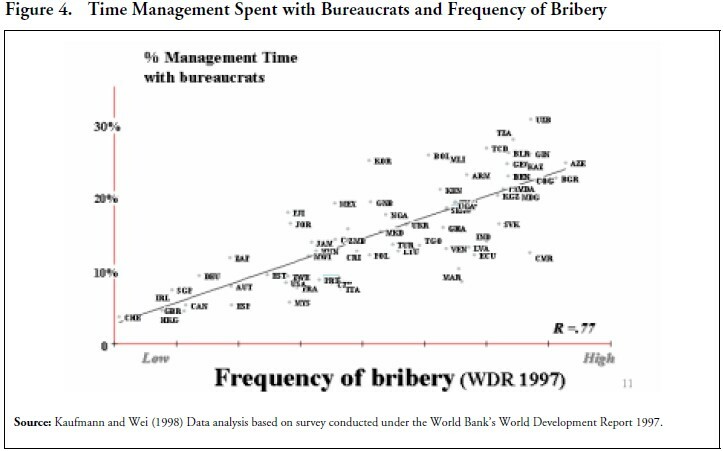 New global standards of behavior are emerging, driven partly by changing attitudes toward transnational bribery in industrial countries and partly by heightened awareness in developing countries of the costs of corruption. But much more work is needed to develop institutionally binding industry standards. These could be furthered through more effective inter and industry standards, and proper coalition building with relevant civil society organizations. Governments. Quite apart of economic and public sector reforms along the lines noted above, a number of initiatives have been taken at the international levels that are bound to have constructive repercussions in many countries. • Twenty-five countries signed the landmark Inter- American Convention Against Corruption in March 1996, two years after the issue of corruption was put on the agenda of the Summit of the Americas by the leaders of the Western Hemisphere. The convention requires countries that have not already done so to criminalize transnational bribery and all illicit enrichment. Other provisions include building commitments to provide greater mutual assistance laws and to establish a framework for cooperation on extradition. In addition, the convention encourages countries to adopt a wide range of laws and regulations to prevent corruption. These measures include conflict of interest rules, disclosure of assets of high public officials and their families, establishment of national organizations for the oversight of such laws, protection of whistleblowers, and open government procurement. • Similarly, in late 1997, thirty-four countries signed the OECD Convention on Bribery of Foreign Public Officials in International Business Transactions. The purpose of the convention is to criminalize corruption of foreign officials and to end the tax deductibility of bribes, thereby removing the associated fiscal incentives. This is a historic first step forward, and one that provides a sound, though limited, framework for an international anti-bribery system. • Multilateral development banks have similarly begun to play their role in their respective areas of expertise and responsibility. The IMF has started to restrict its operations in countries where the level of corruption is deemed to negatively affect in a material way their economic performance. The World Bank has initiated a more comprehensive program. First, it introduces sanctions on firms and governments engaged in corrupt practices. Under this arrangement, it would ban firms that offer bribes from future Bank financed procurement worldwide. It would also cancel loans to governments whose officials solicited bribes. Lastly, the World Bank the reoriented its disbursement procedures to strengthen borrower accountability for sound procurement and financial management. While these are undoubtedly important steps, their proper implementation is key to deliver on the promise of accountable governments and hospitable business environments. Nothing, of course, prevents countries from developing their own action without a common framework in the region. After all, effective action on the fight against corruption will require more than acting through criminal law and sending people to prison. On the multilateral development institutions front, additional actions are also being taken; the Inter- American Development Bank has started to tighten procurement guidelines and enhance support for public sector reform programs. It would be desirable that organizations, such as the World Trade Organization, review their programs to see how they could underpin more forcefully efforts to combat corruption. The World Bank needs to strengthen its working arrangements with relevant civil society institution, and sharpen its country assistance strategies by mainstreaming anti-corruption efforts in its policy, public sector reform, projects, and other lending, as well as its economic and sector work. Private Sector. 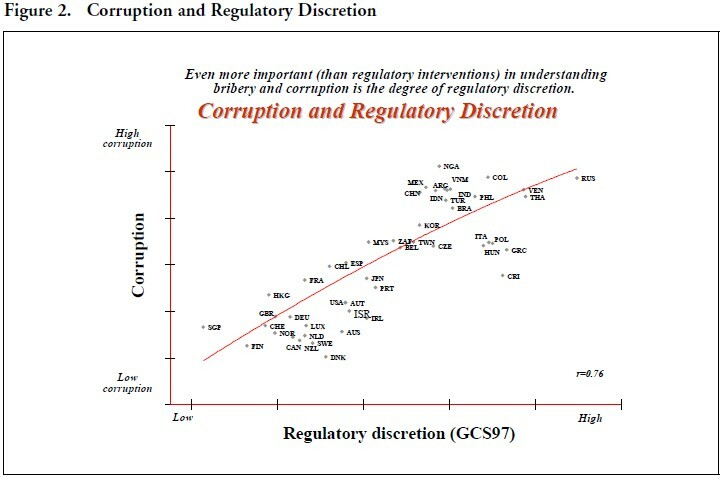 There are differences of opinion about the value of corporate anti-corruption programs and associated codes of conduct. Given the many parties involved, the “going alone” practices have proven to be particularly ineffective. Coalition building approaches with relevant constituencies is thus indispensable. Many in the business community believe that self-regulation is the right solution and that it is preferable to government regulation. Others argue that self-regulation is a sham and only government action can be expected to curb corruption. When seen, however, as a component of a comprehensive anti-corruption program, they could provide a stimulus to more business-like and effective economic activity. They are not a substitute for government regulations: both are needed and each reinforces the other. – Voluntary Anti-Bribery Code for the Mining Sector? • A clear policy statement that the company prohibits employees and third parties representing the company from offering anything of value, directly or indirectly, to a government official to influence or reward an action. • Detailed guidelines regarding gifts and entertainment, travel expenses and strict compliance with applicable laws and regulations regarding corporate political contributions and their disclosure. • The existence of a system of internal controls and record keeping that ensures that company books accurately reflect its transactions, overseen by an audit committee, composed of outside directors and associated internal reporting. • The threat of penalties through criminal law is a potent influence. Managers tend to be concerned about their personal exposure to large fines and prison terms, and such provisions have been found useful in turning off extortion by local or foreign officials by making refusals to pay credible. The synergy between government enforcement and corporate compliance programs is further enhanced by U.S. Justice Department’s sentencing guidelines. These provide more lenient treatment for companies that conduct proper compliance programs. The sentencing guidelines provide a strong incentive for companies to establish compliance programs and usually include auditing and monitoring arrangements, enforcement of disciplinary mechanisms, and appropriate response and due diligence after detection. This approach exists in the United States, and several European countries, Australia, and Canada have or are in the process of adopting similar legislation. • The tax treatment of bribes can also make a major difference in corporate behavior. When the tax laws treat bribes as tax-deductible, the message is that foreign bribes are considered a legitimate business expense—if not a subsidized activity by government. Denying tax deductibility for bribes requires corporations to distinguish between proper and improper business expenses. This means that relevant corporate managers will be carefully scrutinized, as they can be exposed to liability for tax fraud. Civil Society. A growing number of structures, institutions, and associations—outside state apparatus and profit-making businesses—are evolving for the joint and proactive pursuit of shared interests. Chambers of commerce, professional and religious associations and various forms of non-governmental organizations are becoming players, shaping opinions, building coalitions, providing testimonies and monitoring government and enterprises. What legitimates civil society organizations is a concern about issues that are not adequately represented in the normal political process and a focus on problems that often go beyond the limited reach or capabilities of the nation-state, where market forces are unlikely to result in desired results. Moreover, their rules do not arise out of self-interest or profit-orientation, but from people or organizations that are committed to the public interest in a specific area, such as corruption. In the end, though, civil societies are the stakeholders and the ultimate affected parties of corruption—and thus must be engaged constructively to get the support and buy-in for the necessary reforms. Only in this way can the necessary policy and institutional changes become viable and sustainable. Countries that have been hospitable and supportive of civil society bodies—through hearing arrangements in their regulatory and legislative procedures and involving them in oversight institutions—have in fact enabled the organic and internally driven evolution of policies and institutions. As the argument goes, if civil society gets involved as a partner and its efforts at monitoring the state are encouraged, this would contribute to the eventual elimination of corruption.7 However, the issue of partnership is a complex one. Governments, multilateral development institutions and private sector institutions are for the most part established and strong. A growing number of countries have started to take actions that one way or another address some of the issues referred to before. Institutional and civil service reforms in the form of privatization, salary reforms. Disclosure of assets has been introduced in countries ranging from Bolivia and Ecuador to Georgia and others. Economic policies are being revamped through deregulation, de-licensing, tax administration reforms changes in custom administrations in Latvia, Ecuador, Albania and many others. Financial controls and changes in public procurement arrangements have been introduced in Georgia, Ecuador and Bolivia, to mention a few. Public and civil society oversight arrangements are enhanced through ombudsmen offices, private sector monitoring arrangements, diagnostic surveys with civil society involvement in Ecuador, Albania and others. So are legal and judicial reforms, including changes in Supreme Court organization, changes in judicial procedures, new competency and selection arrangements of judges, introduction of mediation and arbitration procedures in Bolivia, Chile, Albania and others. In the end, these reforms are not so much about laws and top-down changes, but more about empowerment, transparency, scrutiny, changes in incentives. More broadly, a combination of actions on prevention, enforcement, and support of the local community could help in overcoming the problems. Many of the corrective actions are associated with deregulation and depolitization of economic activities, generation of information and data for greater transparency and associated accountability, build-up of appropriate legal institutions or set-up of parallel ones—or self-regulating bodies where this is not possible, and development of coalitions to promote coherent actions among different players in a society. In the end, though, any effort has to be underpinned by some form of diagnosis of the specific problem, an ensuing prioritization and sequencing of interventions, and monitoring of impact. Whatever course is taken, experience suggests that focus has to be on minimum, critical mass of interventions—at times a few initial examples—to get some early gains for later replication. Where such interface is poor, there is a tendency to “crowd out” the economy into the informal sector and with it the levels of corruption. For this reason, TI has been set-up to facilitate the intervention between different groups, particularly civil society with governments and the private sector. As effective action can only be sustained through the presence of institutions that can catalyze the various interest groups in a non-partisan manner, TI has been established as a not-for-profit and non-governmental organization to counter corruption in international business transactions. Over the years, it has fostered National Chapters to build alliances, enhance awareness, create support for actions to combat corruption, help overcome resistance of those with a stake in the status quo, and mobilize people and expertise behind meaningful action—and in the end, to improve the interface between governments, businesses, and civil society for effective governance. If experience elsewhere is to serve as a guide for effective anti-corruption efforts, then a purely technocratic approach to the subject will not be feasible or sustainable. Thus, the process of reaching correction actions will be as important as their content. Indeed, in this field, more than anywhere else, the wide ramifications of change can only take place as a result of the dialogue that is internally driven—in each country, in each situation. Only home-grown strategies developed in full partnership with civil society have any chance of success. The means, of course, the technical assistance and other efforts usually provided by the donor community have to move from introducing standard “best practice” to “good fit,” tailormade solutions—better designed to meet local institutional and cultural concerns. In the end, it is for each society to find answers to its own challenges. Others can assist, present a menu of options and practices (see illustration in Annex I), and inform the process, from which local anti-corruption coalitions—the primary actors—must find and force their own solutions and associated strategies for reform. In sorting out the issues and their solutions, it is difficult not to sound a bit trite. There are binding limits as to the specificity of conclusions one can reach without first hand information on Cuba’s state of affairs. Strictly speaking, there are a variety of methods and approaches to diagnose the problems, analyze the feasibility of recommendations with a rigorous assessment of political realities and constraints to reform. For instance, surveys have been developed and carried out in many countries that can help diagnose the extent and source of institutional dysfunction in a country, set reform priorities, and inform policy dialogue. They can, among other things, also help quantify the economic and social costs of corruption, and institutional distortions, and evaluate the quality of public service delivery and of the business environment—and ultimately the corrective actions to be taken. Nothing of this is available in the case of Cuba. That being said, judging from the experience of economies in Eastern European and Central Asian countries, special attention will be needed on issues of internal governance during the transition process. Otherwise, Cuba may easily fall prey—given the lack of market-driven institutions—to insiders and nomenklatura managers, very much as has been the experience of Russia when it rushed into privatizing public monopolies, rather than focusing in creating the checks-and-balances and oversight vehicles to build competition. In this regard, Cuba will start off the process with a public sector that has very low levels of accountability, a poor regulatory framework, although with a reasonably professional public sector, stability and rule of law (see Annex II).8 Under the circumstances, six areas merit special attention. First, corruption and institutional rigidities fuel illicit and unproductive activities, and is a bewilderingly complex issue with deep vested interests. There are thus binding limits to actions aimed at or limiting the “supply” side of corruption through various forms of control arrangements. Actions aimed at the underlying incentives driving corruption (i.e. the “demand side”) and reducing opportunities for discretion, with their attendant associated governance arrangements are bound to work better, and provide in the longer-term more promising avenues to help develop accountable, effective, efficient and responsive administrations. Second, corruption and governance issues are problems whose solutions can only be homegrown. Fighting corruption and restructuring government is thus the business of everyone: governments, private sector, and civil society. An alliance between all of them is a true test of a country’s commitment to the subject. More than anywhere else, in transition economies, the solutions have to be rooted in the build-up of constituencies that are willing to persist in the build up of institutions, and hold accountable public administrations. 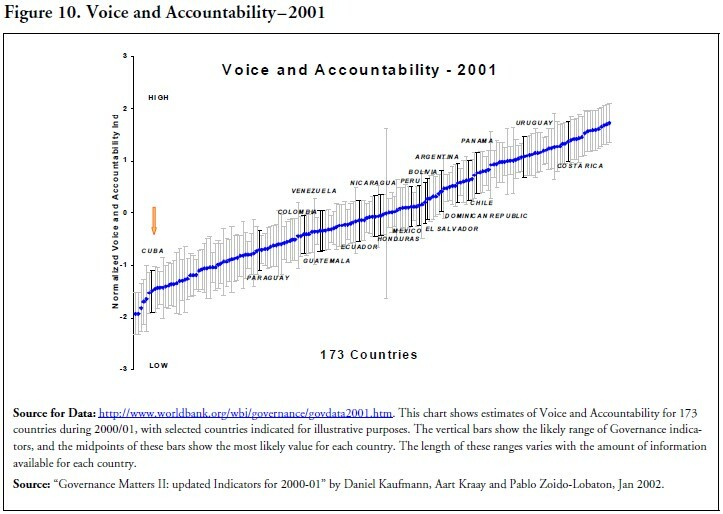 Ideally, a well grounded survey of areas of vulnerabilities, as mentioned above, could turn the policy debate away from a focus on individuals towards institutions, allow the establishment of baselines against which progress in reform efforts can be measured, and encourage attention by the executive, parliamentary scrutiny, and greater participation of civil society to stimulate the demand for better governance and measures against corruption. The buildup of a vibrant and independent private sector and civil society will thus be one of the crucial steps in Cuba’s transition. Third, living in an age of vanishing political borders, rapidly coalescing transnational global culture, and growing economic integration, an isolated existence is no longer a viable option—at least not without a prohibitive cost in economic development as increasingly evident in Cuba. International standards, such as those being adopted by major enterprises, international conventions such as those agreed by the OECD and the Americas, and guidelines adopted by international lending institutions are becoming an integral part of the global scene of increased transparency and growing concern on corruption. No country is immune to these global trends. It is thus incumbent upon all countries and institutions to deal with these issues—or world economic development will bypass those who prefer to remain on the old course. Technology changes, growing information flows, and the attendant increases in competition are forcing businesses to provide superior goods and services at competitive prices. Bribes may “sell” obsolete and high-priced goods—but at the cost of losing competitive edge. In the end, success will only come to those able to thrive through their ability to develop knowledge in every field of their business, to innovate for superior performance. The key for them is transparency and accountability—and their success is rooted on being better, not just good. Fourth, improved enterprise performance must be at the heart of any successful transition from a command to a market-oriented economy. The standard pattern in the transition economies has been to seek to improve companies by heightening competition and enhancing corporate governance in various ways: by privatizing state-owned firms; by allowing and encouraging new firms and competition between existing firms; and by withdrawing government subsidies so that firms must face their own profits and losses, or what the literature refers to as a hard budget constraint. The ability of reforms to improve corporate performance appears highly sensitive to the institutional environment and initial conditions in which the policies were introduced—and Cuba’s starting point is for the most part weak in terms of initial conditions of the enterprises involved, the institutional and legal framework, especially the corporate governance structure; the relationship between the very small private sector and the state; and the competitiveness of product markets. Fifth, similarly, the widely accepted legitimacy of the entire interface between Government and enterprise sectors needs to be addressed. The economies of Central Europe were led by legitimate governments elected on platforms of reform, while the reformers in Russia and many of the CIS countries represented a small but powerful political group that was advising the president, but was opposed by much of the parliamentary and civil service structure. Moreover, governments in Russia and other CIS countries had to make compromises in introducing policies to build internal political support for reform, perhaps because they faced more deeply entrenched managerial interests. It is unclear the extent to which the vested interests in Cuba have been institutionalized. To the extent that they are, this could result in reforms that may be less conducive to improved enterprise performance and restructuring, notably with respect to privatization methods, corporate governance, competition, and subsidies. Sixth, concerning issues of process, the same applies to overall public sector management. Many governments (and Cuba may not be an exception) have found to their dismay in recent years that secretive decision-making by small elites can no longer be sustained. Contrary to the claims often made by central banks, government officials, and even some in international organizations that decision making on technical or complex subjects is best left to experts, without informed participation by all those affected, policy decisions will fail to take into account important information and interests and will lack legitimacy that only public voice can bring. Transparency plays many beneficial roles in both market and governance. All indications are that it increases the efficiency with which markets operate and may reduce the likelihood of financial crises. On governance, transparency is logically necessary for accountability; such accountability is the political equivalent of the efficiency generated between firms. Since political authorities are monopolies, “competition” occurs between ideas and use of resources, rather than organizations. But a culture of transparency will not come solely as the result of hectoring—or even conditionality applied by the international financial institutions. It requires thinking beyond disclosure standards that are being so widely discussed to question the incentives facing public sector activities. In sum, corruption is a highly sensitive issue. There is nothing right about it. It is wrong in principle, wrong in practice, and wrong wherever and whenever it occurs. Transparency and changes in incentives are the best antidotes. But, as all indicators suggest, Cuba is a long way from a transparent level playing field. Different organizations and different countries draw different lines in the sand in different places. And the deeper truth is that legitimate investment and corruption do not mix. Corruption destroys billions of scarce dollars every year. It is the dry rot undermining aid. It distorts development, it frightens away genuine foreign investors, and it perverts societies. The road to reform, competition, and modernization seems to be the only hope for a revitalized Cuba, and it passes through an open incentive structure, and the build-up of associated governance arrangements to guarantee the competition of ideas, products, services and opportunities. Below is a wide (but not exhaustive) list of steps that might be part of an anti-corruption program. Not all steps are appropriate in every setting, and not all are steps that can or should be taken. It is essential to diagnose an individual setting and consider proposed solutions carefully and to work closely with allies in the government and with other partners to coordinate strategies and identify individual activities that complement each other. • Establishment of “competing bureaucracies” (either horizontally—within one level of government, or vertically—among different levels of government) to deliver similar services where possible. • Encouraging alternative legal institutions (to conventional public rule of law institutions) for settlement of disputes, mediation, etc. • Review of anti-corruption and conflict-of-interest legislation to ensure adequacy. Governance can be depicted as the traditions and institutions by which authority in a country is exercised. This includes (1) the process by which governments are selected, monitored and replaced, (2) the capacity of the government to effectively formulate and implement sound policies, and (3) the respect of citizens and the state for institutions that govern economic and social interactions among them. 1. Vito Tanzi and Hamit Davaodi, “Corruption, Public Investment, and Growth,”IMF Working Paper 97/139 (1977). 2. Dieter Frisch, “Les effets de la corruption sur le developpement,” TI Working Papers Series, No 7 (1995); D. Kaufmann, “Corruption: The Facts,” Foreign Policy (Summer 1997). 4. Miguel Schloss, “Does Petroleum Procurement and Trade Matter,? Finance & Development (March 1993). 5. 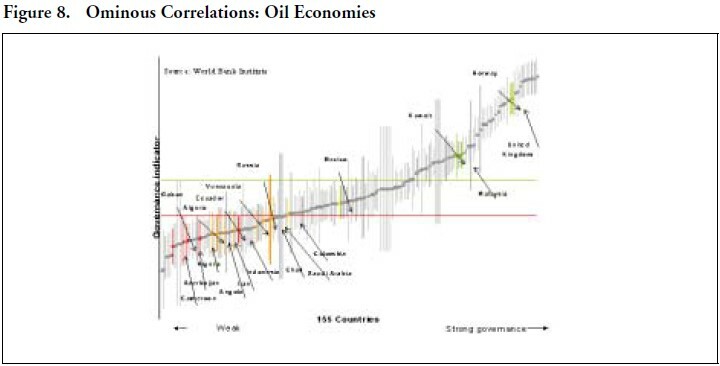 Carlos Leite and Jens Weidemann, “Does Mother Nature Corrupt?,” Natural Resources, Corruption, and Economic Growth, IMF working Paper 99/85 (1999). 6. Transparency International-USA, “Corporate Anti-Corruption Programs, a Survey of Best Practices,” (1996). 7. Transparency International, “The Corrpution Fighters’ Tool Kits” (October 2001); “Herramientas para Control Ciudadano de la Corrupción” (Octubre 2001). 8. 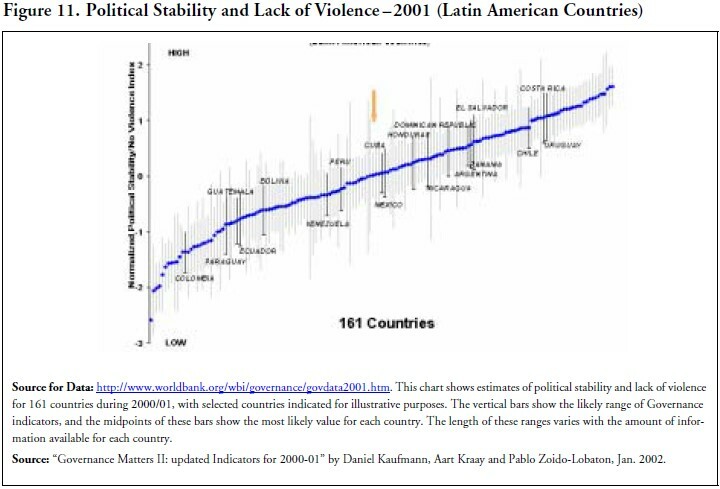 Daniel Kaufmann, Aart Kray, Pablo Zoido, “Governance Matters II.” World Bank Policy Research Working Paper 2772 (February 2002).